The Association has no written constitution, no express statement of its reasons for being. But inherent in its very existence is the assumption that journals committed to the dissemination of the best research and thought in labor and employment law and policy would benefit by having a forum in which to share developments – economic, social, legislative, and judicial – and to place them in comparative context; to serve as a clearinghouse for common substantive and editorial concerns. Accordingly, the Association is open to all qualified journals that share this mission. Have as its primary focus collective and individual employment law and policy, domestic, comparative, or international. The addition of cognate areas of interest, e.g. labour economics, sociology, and industrial relations is welcome so long as these complement the central legal focus. Be generally recognized in its jurisdiction as a venue for research and analyses of consistently high quality. In the ordinary course, this standard contemplates that the journal be of an academic or scholarly character; but practitioner-oriented journals or research serials (commonly sponsored by government agencies) will qualify if sufficiently sophisticated in content and highly regarded in the jurisdiction. A newly-founded periodical, lacking an established reputation, will also qualify if its editorial auspices and profile of pieces published thus far give adequate assurance that it will achieve the regard this standard requires. Be willing and able to participate in the Association’s activities and in attending and, from time to time, hosting the Association’s annual meetings or other functions. Approved at the Association meeting in Toronto, May 7, 2005. 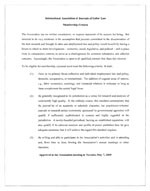 Based on experiences and decisions made during the IALLJ meetings (Leuven, June 2015 and Bologna, November 2016), the IALLJ members have decided, following a due process concern and bearing in mind an openness for all relevant labour law journals, to deal with new applications for membership with the IALLJ in two separate rounds. Applications are made well documented to the President of the IALLJ before 31 December of the year preceding the year of the next IALLJ meeting. Year 1 (first round) : During the first following IALLJ meeting, a first orienting discussion will be held on admissibility, scope, quality, content, methodology (such as peer review) of the applicant journal. If possible, the IALLJ will make a decision on prima facie admissibility on the basis of the submitted documents. To prepare this decision, the IALLJ President or, at his request, another IALLJ member’s representative, can consult recognized academics/peers to receive a viewpoint about the academic status of the candidate Journal-member. 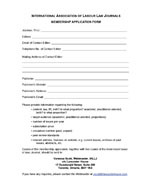 Year 2 (second round): During the following IALLJ meeting, to be held in the subsequent year, the IALLJ will invite the applicant-Journal’s editor to present the Journal, in order to come to a final decision after due consideration, unless the first round has caused a need for longer consideration or investigation. The decision during this second round may nevertheless entail a decision of deferral for a period then to be decided. Also in this stage, the IALLJ may ask one or two referees to give an opinion about the applicant journal taking into account the membership criteria.